Physical characteristics: Southern ground-hornbills are the largest in size and darkest in color of hornbill species. They are black with white primary feathers, the largest flight feathers, and red throat skin. Males have bare facial skin, and throat skin that can expand. Females have a blue patch on their red throat skin. When flying, white wing patches are visible. Juveniles are browner than adults, with black flecks in the primary wings, gray sides that reach to the bill, and pale gray-brown facial skin. Adults are 35.4 to 39.4 inches (90 to 100 centimeters) long. The male weighs between 7.6 and 13.6 pounds (3.5 and 6.2 kilograms) and the female weighs between 4.9 and 10.1 pounds (2.2 and 4.6 kilograms). Geographic range: They are found in eastern South Africa, Botswana, northern Namibia, Angola, and southern Burundi and Kenya. Habitat: Southern ground-hornbills live in woodlands, savannas, and grasslands next to forests. They are found at elevations up to 9,800 feet (3,000 meters), preferring moist habitats. Diet: Southern ground-hornbills are mostly carnivorous, eating only meat. They eat insects, grasshoppers, beetles, scorpions, and termites. During the dry season, they also eat insect larvae (LAR-vee), snails, frogs, and toads. 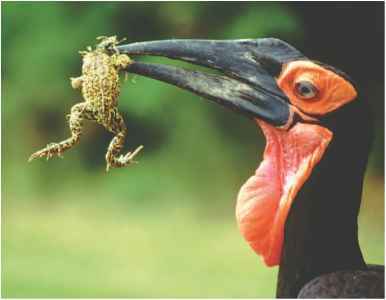 Sometimes southern ground-hornbills eat larger prey, such as snakes, lizards, rats, hares, squirrels, and tortoises. At times, they will eat carrion (decaying animals), fruits, and seeds. 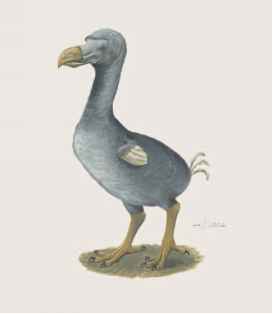 The birds are able to eat these animals by using their powerful dagger-like bills to cut and tear their prey. Southern ground-hornbills hunt in groups from the ground by walking, probing, pecking, and digging. Behavior and reproduction: Southern ground-hornbills roost in trees. They live in groups of up to eight birds, with each bird of the group sharing and defending a territory. 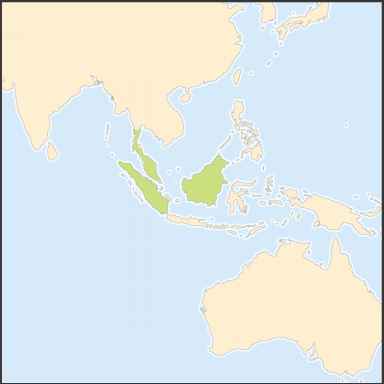 The territory may be as large as 36 square miles (100 square kilometers). Nests are holes in trees or rock faces, lined with dry leaves brought by males. The entrance is not sealed. Females lay one to three eggs at intervals of three to five days, usually from September to December. The incubation period is thirty-seven to forty-three days. Adult and immature helpers usually assist the dominant pair, and feed the nesting female. Chicks are hatched with pink skin that turns black within three days. At about eighty-six days, young birds fledge, or grow the feathers necessary for flight. Southern ground-hornbills remain with the parents at least until maturity, about four to six years. Southern ground-hornbills and people: Local people think highly of southern ground-hornbills, but also eat them for food and medicinal, healing, purposes.